We are home! It seemed like we were gone forever and over so fast if that makes any sense. It was a wonderful break from everyday life. I met an artists selling prints of his work on the island of Tortola. What a life! Painting in lush, tropical surroundings and meandering down to the beach when the cruise ships come in. I, of course, took my journal and my travel art kit, and by starting several pages at home, was able to complete them while I was away. Can’t be away from art for too long:-) I will share more later, but here is a page for now. Glad to hear you had lovely Thanksgivings, shared with family and friends. Just for Christmas, I am offering free shipping in the US and Canada the first week in December, on any purchase of an original piece of artwork from my etsy shop. Ahhhh yes, it is always so nice to come home again after a trip. Nothing like home :)Love your journal page and am soooooo excited to start your class in January, it will be a great start for a New Year! So glad you made it home safe and sound. i love the girl with the seashell to her ear in this. That would be the life, surrounded by ocean. But maybe I wouldn’t enjoy it as much if I was around it everyday. Welcome back Pam…I sure missed seeing you around. what a wonderful souvenir journal page from your trip 🙂 So glad you had a fabulous time! Welcome back Pam, and am so happy your little trip brought you such joy!! Your journal page is awesome!! Can’t wait to see what else you created!!! Hi Pam,Glad you had a great time on your vacation and hope your Thanksgiving went well also. I have an Award for you over at my blog. Come by and get it if you want. what a glorious blog! Your work reminds me of some of the work by Fransisco Clemte (who I adore!) Thank you for the comment on my blog – I feel like I just discovered a new treasure!!! Pam, glad you had a wonderful vacation…as “quick” as it was!! They do seem to fly much faster than we’d like!! 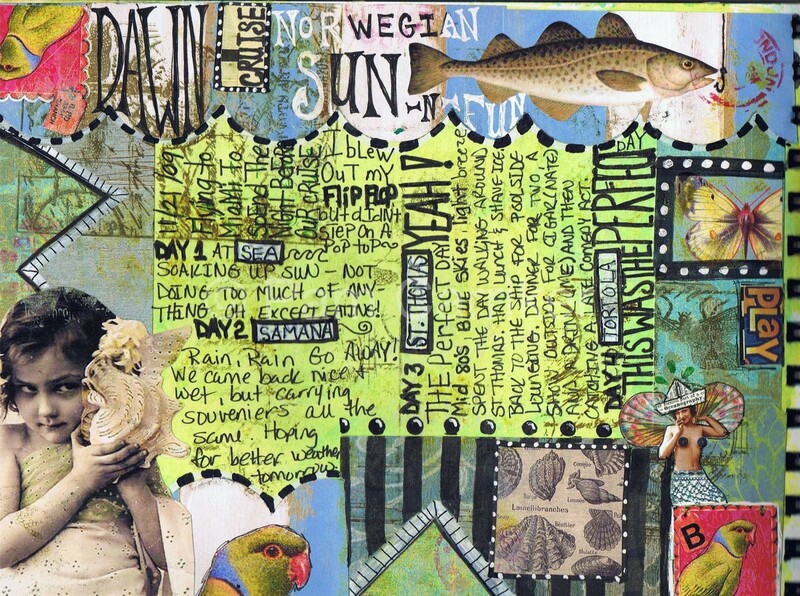 Your journal page is amazing…and I’m smiling at you not being able to be away from art for long!!! Can’t wait to see what else you did! !